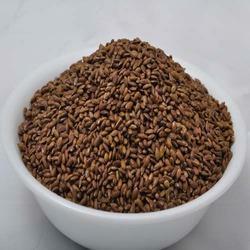 Our product range includes a wide range of flax seed mukhwas and roasted flax seeds. With years of experience and knowledge in this domain, we are engaged in manufacturing premium quality Flax Seed Mukhwas (Saptadhanya Mukhwas). In line with the set food industry standards, our provided seeds are processed from the latest machines under the supervision of our trained professionals. Widely used after meal as a mouth freshener, these seeds are available in various packaging options and flavors to cater the diverse demands of our prestigious clients. In order to meet the various requirements of our esteemed clients, we are engaged in offering a qualitative grade of Roasted Flax Seeds that is roasted using the latest processing machines. Our offered roasted seeds have rich fiber content that is beneficial for weight loss and body strength. In addition to this, we provide these roasted seeds in different packaging options to our clients. Our prestigious clients can avail these seeds at pocket friendly prices from us.